While we are still at small cats, I thought I might as well discuss the issue of neutering here. Now we all love our cats and many of us would prefer them in their natural body form i.e. not subject them to any surgery or general anesthesia. But there is one procedure for which I really do recommend prompt and timely surgical intervention...sterilization of cats. Male cat - When your tom cat reaches puberty at nearly six months of age, he will start yearning for female companionship, and it's not his fault - it's only natural. He will meow at night, spray foul smelling urine all over the house aside from his litter box, and totally ignore all your attempts to control him, in short there will be a total change in his personality and it will continue...until you let him out! Once outside your tommy boy will be no match for the feral who have grown on their own and are much better hunters and fighters than your pet who never learned to fend for himself under your loving care. So when he's gonna eye female felines and try and establish his territory, he'll end up inevitably in a fight with another feral male - and return to you with a scratched face and scarred ego! You'll worry about him but there's not much you can do - he will go outside again - and this time may not return (as your domesticated pet he didn't even learn how to cross a street or avoid humans!) And you'll be left with heart break, uncomprehending...when all of this could be avoided by a simple procedure...neutering. 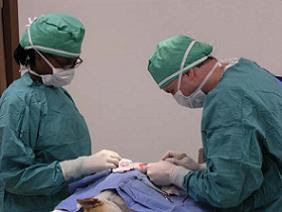 The surgery is one of the simplest in all of veterinary medicine. Carried out under general anesthesia your pet will be discharged the same day and will have no adverse personality changes! Female Cat - Here you have a lovely queen who adores you, rolls on your feet and shows affection for the whole family - until she reaches puberty (again at approximately six months). Now your sleep every night is disturbed by her constant yowling! She desperately wants to get out and meet a tom - and she can't help it...she's in heat. You try to soothe her but to no avail. Finally you let her out. She returns after a few days, relatively unharmed. However, she continues to venture outside periodically, much to your concern, where she is exposed to unhygienic conditions and diseases. A few months later she bears a litter of four kittens. Now you have a problem - what to do these with these new babies. This will continue every few months and your house will become crowded with cats, you will be left wondering if it's a good idea to keep pets? Again all of this could be avoided by a similar surgery...spaying (ovariohysterectomy). Your cat will no longer come in heat and will lead a happy, healthy life! Even if the above does not motivate you enough, remember this, sterilization also reduces the risk of cancer in cats (testicular in males, ovarian in females!). What's the right age for neutering? I'd say before puberty...around four months! No use letting the cat have one litter since they may only learn a behavioral trait that you don't want! This is regarding sterilization of pets brought up in human living conditions. What about the so called strays? Is the operation risky? and for how much time would a female cat experience pain after the operation?